Today on the grill: dessert! 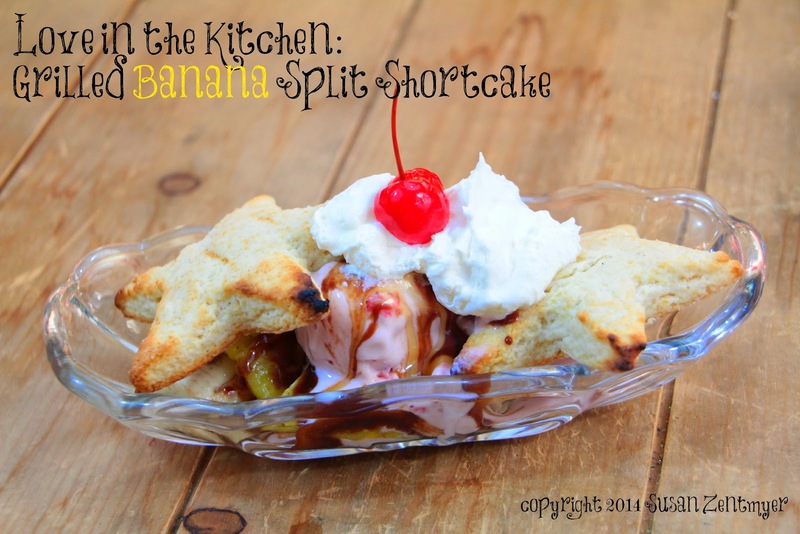 Everyone loves banana splits. Just what makes this dessert so delicious? A long boat-shaped bowl filled with big scoops of different ice cream flavors and flanked by banana halves is a showstopper for sure. And the clincher - pineapple, strawberry and chocolate toppings glisten atop the ice cream rounds. We've upped the ante here. Grilled banana and pineapple, carmelized to perfection, and light buttery shortcake earn this twist on an old classic a a blue ribbon. 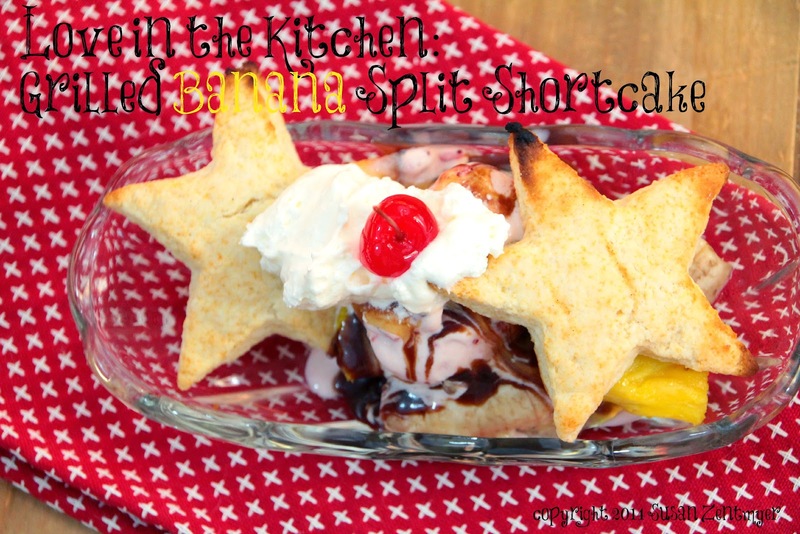 Homemade shortcake makes this dish just exceptional - but you can save time by using storebought shortcake, or even pound cake slices. The Perfect Burger.... with Options! Preheat the oven to 400F. Sift flours, sugar, baking powder, salt and baking soda into a large bowl. Add the butter pieces and mix with your fingers until the mixture resembles coarse meal. Add the buttermilk and stir until just blended. Gently knead the dough on a floured surface until dough holds together. Roll out on lightly floured surface to 1/2 inch thickness. Using a 3 inch diameter star cookie cutter, cut out shortcakes. 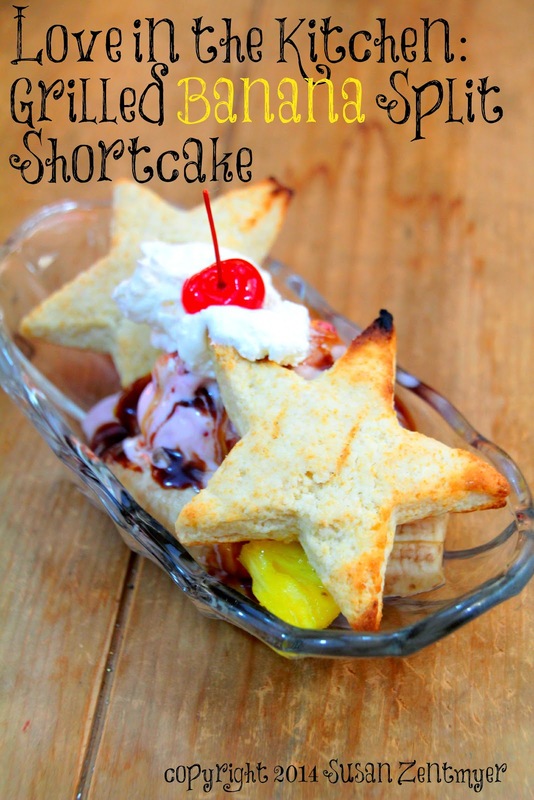 Gather dough scraps, reroll and cut out additional shortcakes, making a total of 12 shortcakes. Arrange on a baking sheet, spacing two inches apart and bake for about 12 minutes or until shortcakes are light golden brown. Brush the cut side of the bananas and both sides of each pineapple slice with melted butter. Place the bananas, cut side down, on the center of grill. Grill for 2 minutes or until grill marks appear. Using a pair of tongs, turn them over and cook for 5 more minutes, or until the skin pulls away from the bananas. Add the shortcakes to the grill for the last 2 minutes to heat them. 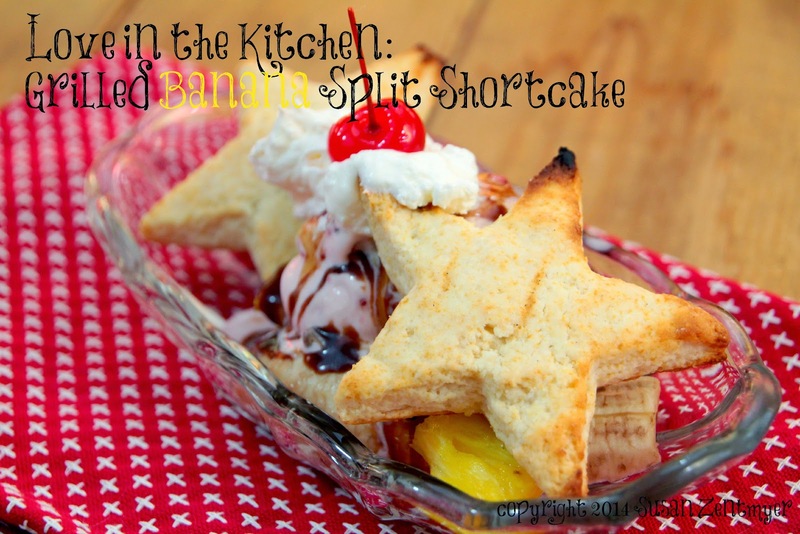 Place one shortcake on the bottom of a bowl or banana split boat. Peel one of the banana halves, and cut into two pieces. Add the banana to the bottom of the bowl, then place the pineapple on top of that. Scoop 1/3 cup of strawberry ice cream on top of the pineapple. Drizzle hot fudge sauce and butterscotch sauce over the top of the ice cream. Add a second shortcake to the top. Finish with a dollop of whipped cream and top with a cherry. Repeat for remaining servings.